Your peroneal tendon wraps around your ankle, giving you stability and strength. If you suffer a painful peroneal tendon tear, you can’t walk without assistance. To get back to your active lifestyle seek out treatment for peroneal tendonitis. In Manhattan, the Sports Injury and Pain Institute of NYC offers peroneal tendonitis treatment in a comfortable, professional environment. 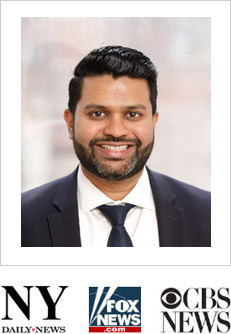 Meet our Ankle specialist Febin Melepura M.D. to get the pain relief you need in the safe, reassuring hands of the best sports injury specialists in NYC. New York residents are known for their strength and resilience, but even the toughest New Yorker can have trouble standing strong when dealing with the pain of tendonitis. Even the simplest activities can become a challenge when you’re having trouble walking without ankle pain. While peroneal tendonitis is most common among athletes, anyone can be affected. Your bones provide the structure for your body, and your muscles control your motion. Tendons tie them all together to make your body a functional machine. Tendons bind muscle to bone, stretching as needed to keep things moving smoothly, but tendons are tougher than muscle. The peroneal tendons are two bands of tissue stretching from your calves to your feet. They help you control the movement of your feet and ankles. 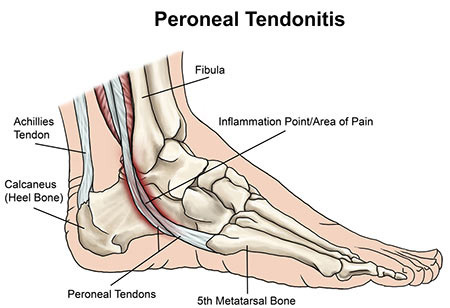 Peroneal tendonitis refers to a peroneal tendon tear or other injury to those tendons, such as being overstretched. When the tendon rubs against the bone, it causes pain, discomfort and inflammation. Peroneal tendonitis also causes swelling, especially at the back of your ankle. Some people with peroneal tendonitis notice that the area feels slightly warm to the touch. Injury to your peroneal tendons cause your ankle to feel unstable, making it difficult to bear any weight on that leg. Peroneal tendonitis is often the result of overuse. It can be caused by excessive training or by beginning a rigorous exercise program without working up to that strenuous level. Failure to stretch before starting an activity can lead to a tendon injury, even among people accustomed to physical activity. People with very high arches or whose ankles pronate – when they tend to roll to the side — may be prone to developing peroneal tendonitis because their ankles aren’t adequately supported. The same is true for people who have low muscle tone in the lower extremities. If you’ve suffered an ankle injury such as a sprained or broken ankle and didn’t complete proper treatment for the injury, you’re more likely to develop peroneal tendonitis in the future. Treatment for peroneal tendonitis starts with an accurate diagnosis. When you visit your Manhattan sports medicine practice, the physician takes a full inventory of your symptoms, along with a complete medical history. Disclose any activity that you were involved in prior to the injury; it helps the doctor determine the possible cause. The next step is a physical exam on your sore foot and ankle. Sometimes, it’s necessary to move it around or apply pressure to determine the points of pain. You may need to have an x-ray, MRI or other diagnostic tests to rule out problems in the bone or muscle before proceeding with peroneal tendonitis treatment. The common first step in peroneal tendonitis treatment is simply rest. You’re in pain because your tendon has been overworked, so resting it helps it heal by itself. Your physician may recommend you stay off your feet completely. Depending on the severity of the injury, you may be given a boot to wear to immobilize the joint. Bracing the injury is an effective treatment for peroneal tendonitis. Anti-inflammatory painkillers such as ibuprofen relieves your pain and reduces the swelling associated with peroneal tendonitis. Apply ice to reduce the swelling as soon as you notice you’re hurt. In very serious cases, the doctor may recommend an injection of cortisone to stop the pain. Surgery is only an option if all other peroneal tendonitis treatments have been unsuccessful. Physical therapy speeds your recovery and teaches you ways to exercise more safely. A physical therapist works with you to devise a plan that allows you to remain active without increasing the risk of further injury to your tendons. Once the pain and swelling go away and your sports and pain doctor is confident that your tendons have healed, you can return to normal activity. Many people recover from peroneal tendonitis with no further complications. Sometimes, though, peroneal tendonitis becomes chronic or recurring. Wear shoes that fit well and have good arch and ankle support, especially while exercising. Always warm up and stretch before beginning an exercise routine, even if you’re just strolling around the park or shopping in Midtown Manhattan. Consider wearing an ankle brace when doing repetitive activity such as walking or playing sports. Do you have any questions about the peroneal tendonitis treatment we offer in NYC? Would you like to schedule an appointment with the best rated ankle specialist, doctor Febin Melepura MD of sports injury and pain management clinic in New York? Please contact our office for consultation with the pain relief specialist in Midtown Manhattan.